Obama’s former ethics counsel is suing Trump. Spoiler: He thinks Trump’s actions are illegal, and he’s suing him. President Donald Trump speaks at the White House on Wednesday in Washington. 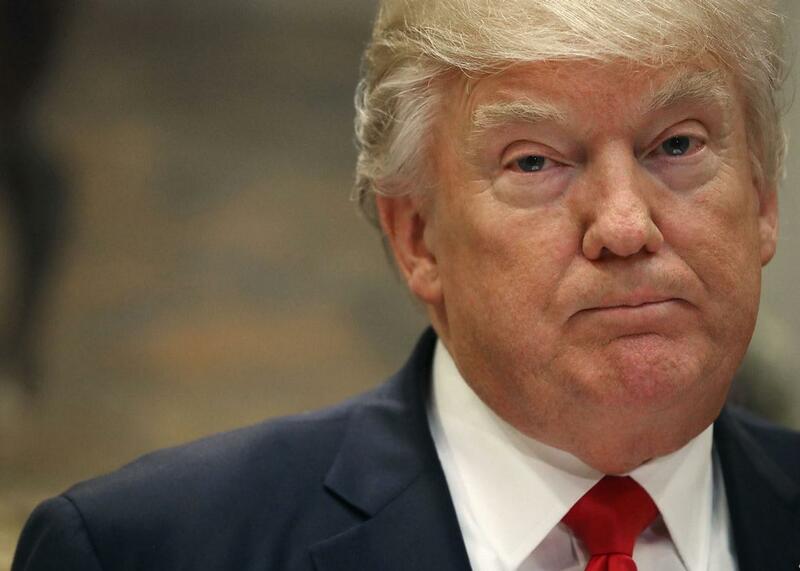 In late April, government watchdog group Citizens for Responsibility and Ethics in Washington expanded its lawsuit against President Donald Trump to include two new parties who have allegedly been harmed by Trump’s continued interests in his business enterprises. On this week’s edition of Amicus, Dahlia Lithwick sat down with Norm Eisen, former ethics counsel to President Obama and co-founder of CREW, to discuss the ethical issues of the Trump administration’s first 100 days, why the president’s tax returns still matter, and what he believes is the single most concerning ethics violation of the new commander in chief. To hear Lithwick’s whole interview with Eisen, subscribe to Amicus. Below, Eisen’s comments have been condensed and lightly edited. One of [our country’s founders’] main anxieties was that, because of the power that our republic invests in the president, that a president could be bought off to compromise the interests of the United States as a whole. There were two different types of anxieties. One anxiety was expressed in the Foreign Emoluments Clause. And that was the anxiety that a foreign government would provide cash or other benefits to an American president and would cause the American president to compromise the interests of the United States. This was not a fantasy, because it was common practice in the 18th century for foreign sovereigns—the Bourbon throne paid off King Charles, for example, and distorted British policy for decades that way, and American officials had been the targets of payments from foreign governments. So for a fledgling country, this was not an abstract, an obscure, or a remote possibility; it was a terror of the founders and the Framers, and that’s why they gave us the Foreign Emoluments Clause of Article I, which provides that no presents, cash, benefits, or as they referred to them, “emoluments of any kind whatever” may be accepted by a president. It’s very sweeping, subject only to congressional consent, which of course we don’t have with Trump. But there was another worry, and it may have been an even greater worry than the foreign emoluments. Certainly it was just as profound. And that was that a president of the United States would be paid off by the federal government to benefit it at the expense of the states, or paid off by one or more of the states to benefit them at the expense of the feds and the other states. Why were the founders and the Framers so worried about that? Because the United States was cobbled together, our federal system, by these individual state sovereigns who had a lot of sovereign authority, and there was a lot of debate about the proper balance of power among the states and between the states and the federal government. It’s still a live issue today. To deal with that, in Article II of the Constitution, the founders and Framers put in a rule that the president may not accept any other compensation from the federal government or any of the states, apart from his salary. And that’s the Domestic Emoluments Clause. Those are the two concerns, and they are live concerns today. That’s why we have brought our amended complaint, which builds out the domestic emoluments issue, in addition to the foreign emoluments one (and does a bunch of other things, including adding more plaintiffs). I’m tremendously concerned about the many discretionary grants, payments, other benefits, permits that Mr. Trump requires for his hotels. There’s a large amount of these benefits that he gets. Often he’s notoriously litigious, he fights about that, so these are flows of things of great value, in any state where he has a property. How can we be sure that he’s not going to attempt to favor those properties, and the states where those properties exist, at the expense of the other states and the federal government? And there are so many of them! Importantly, the founders didn’t set up any kind of an intent test. They didn’t want to get into the question of what was going on in the head of the president. They simply said, No foreign government cash or other benefits or presents, none from the federal government besides your salary, and none from the states, and he’s violating it, all over the country and all over the world. So, that’s why we’re litigating. Certainly, the Framers did not intend emoluments to be a political question, because there’s no waiver provision for domestic emoluments. Congress doesn’t have the power to waive it. These types of issues, of federal officials receiving improper payments, were commonly litigated in the early federal era—nobody’s been bold enough since to try to do what Trump has done—so it’s clear that it’s not a political question. We think it’s fully justiciable by the federal courts. It’s actually pretty simple. The court has the power to tell, as a co-equal branch of government in the system of checks and balances, which I’m so glad we have now, when you see the rampant illegality in the White House, the court will simply say to Mr. Trump—and he must listen—“No more emoluments. You must stop taking foreign presents, cash, and benefits, and domestic ones, from the federal government and from the states, or any agents or instrumentalities of those governments.” Then it’s going to be up to Trump to say how he’s going to comply with that. I think the way that Mr. Trump will have to comply is simply to do what every president has done for the past 40 years, which is to divest his holdings to a blind trust or to the equivalent so he doesn’t have business entanglements. And Mr. Trump can do that very simply by signing a paper, a short power of attorney, turning all of his ownership interests, just as he did with his management interests (although he’s backed off on that, because now we know he’s talking to his son about management), but he can say, “I’m turning over my ownership interest to you, Mr. Trustee, independent professional, not a family member,” with instructions to sell them as expeditiously as humanly possible. What more can he do than that? That’s what other presidents have done of both parties, and that’s what he should do. Norm Ornstein and I have taken to calling ourselves the “ethical Norms.” I think we have been, along with many others, leading the outcry against the violation of these values, these American values, really, that are instantiated in the norms. But it’s not just about the norm violation, because what happens is you start out to say some non-normative, nasty things about Muslims or migrants, but then you back into constitutional violations, where courts are not slapping him on his wrist because he said something bad; they’re slapping him on his wrist on the ban because he said something bad that revealed an intent that was improper for official action and so violated the Constitution. It’s the same with the norms of public service versus greed that the president and his family are violating by hanging onto their businesses, pretty nakedly exploiting, in the president’s case, his public office for his own private gain. He’s spent a third of the days of the presidency visiting his businesses! Exactly the same as it was with the Muslim ban, though he’s backed into a set of violations on accepting presents, cash, other benefits from foreign governments, the federal government, and the state governments and that is not a soft violation. That is a hard violation of a core, the most core document in our rule of law system, the Constitution, and we’re going to be holding him to account for it in a court of law.